« It’s time, once again, to look into the future of KDE/Mac. Nothing huge code-wise has changed from a Mac point of view, other than all of the general updates that have gone on in the KDE codebase since the last snapshot. It appears that kdeinit4 and kded4 both have some crashing issues related to something deep in Qt, I will be investigating it when time permits. In the meantime, a lot of apps still work. 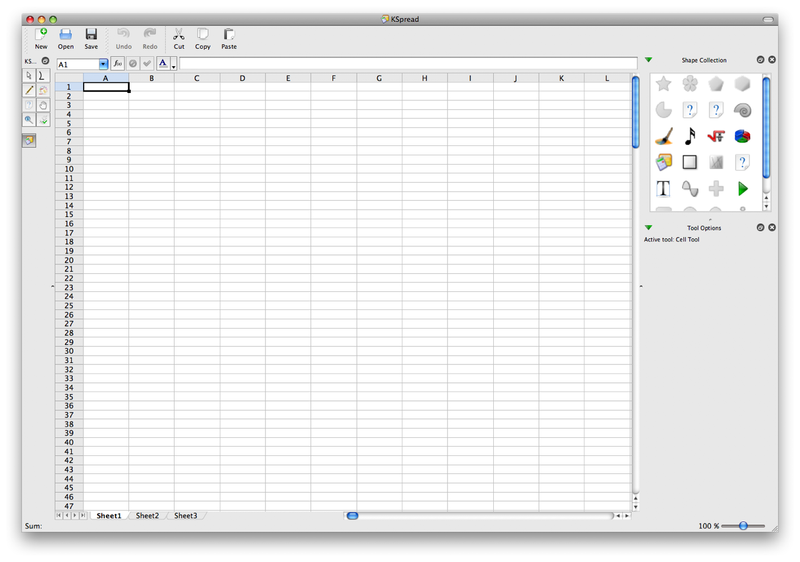 Notably, KOffice apps appear to work now! In fact, KSpread is looking pretty darn good. The torrents are still in the process of uploading to my seed servers, I’ve got most of them finished but a few are still going, and the “everything” torrent is still going, so if you’re impatient, grab the individual packages of the stuff you want for best results. Note that I will be traveling to San Jose for the release event today, so you may see the torrents stop updating for a while but I will resume them as soon as possible. As always, comments and questions are welcome, just send me an e-mail or reply in the comments here. In my opinion pre-release packages like Amarok and KOffice shouldn’t be thrown in with the rest of KDE. That said, what do you mean OS X doesn’t have plasma? There’s a quicktime backend in kdereview. Last time I got Amarok to build, the plasma stuff was linked, but didn’t display. I was under the impression that plasma used QX11Embed to display stuff; if that’s not the case — awesome, maybe if I can get Amarok building again the center-panel will work. Ian (and possibly Benjamin), you are confusing plasma and phonon it seems. Amarok uses both (well, at least libplasma), but libplasma should be portable pretty easily, as it compiles on windows. Phonon on the other side, responsible for encapsulating the sound backends, the one which recently gained Quicktime support through TTs contribution, was the only missing last time I was looking, at least on windows. Phonon already works, so yeah, no issues there. Plasma, on the other hand, does not currently exist/build on OSX (it’s in kdebase/workspace, which is not enabled on Q_WS_MAC), and last time I checked, Amarok supposedly had a big empty window in the middle that was supposed to be filled with plasma-based widgets. I haven’t dug into it for a bit so my memory’s a bit fuzzy, but that’s how I understand it. About plasma, I thought that the workspace was X11 dependent, but not the libs. Amarok using only libplasma should work on OS X and Windows, even if as it is now, the central panel is just empty and plasmoid are not well displayed (under linux ). I am not shure, but I think I saw a screen shot of Amarok, showing it compiled on Windows (with the central pannel), so it should work on OS X too. After a little playing, it was possible to #ifdef out a few bits and get libplasma to compile. However, it’s still in kdebase/workspace by default so wouldn’t get compiled without some cmake surgery. If I can confirm that libplasma actually does something in Amarok, I’ll look into getting it moved to kdebase/runtime or something. Thanks for the new build! I’m grabbing & seeding as I write. Wow! Great to see a new snapshot. In the last 14 days I tried to build the kdemac stuff on my own and had so many issue. I will try my luck with your snapshot and see what you have changed. Haha yea I was totally confused. Sorry. Amarok compiles its own libplasma, whether its in workspace or runtime wouldn’t matter. This is because libplasma isn’t ABI-stable yet, so we’re just statically linking to an “internal” libplasma until it is (in reality its just a svn:extern). to apply a mailing list? I think you can send a mail to sysadmin _AT_ kde.org, then can get it. server? then many mirrors can get them. I’m having trouble with KDElibs. It tells me that the run postflight script failed. Is there anything I should do now? Installed the packages you recommended on the KDE site. I had the same problem. You have to install strigi (IIRC) before kdelibs to get that script to succeed. But it’s actually pretty safe to ignore the warning — the same postflight script gets run for a bunch of the installers so it’ll get run eventually. You can even run it yourself (using sudo) in Terminal once strigi’s installed.